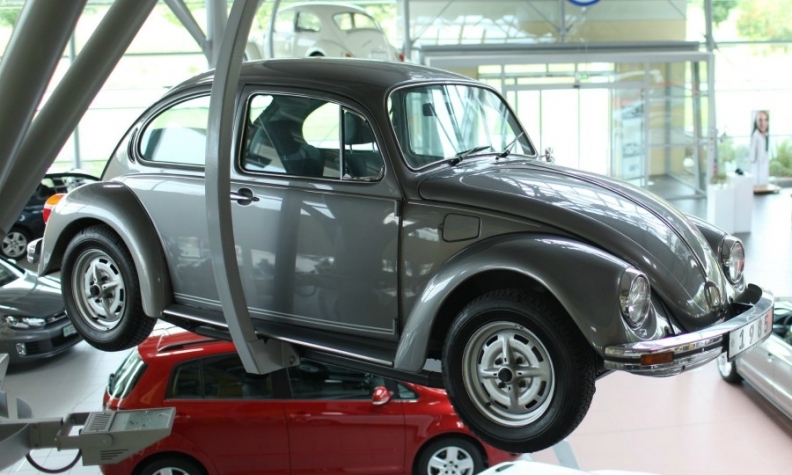 A vintage VW Beetle is displayed at a dealership in Nuremberg, Germany. Volkswagen bosses are considering the future of the brand's iconic Beetle. Small, impractical two-doors coupes are losing favor with buyers, so the solution for the next Beetle may be an electric-only model. VW brand chief Herbert Diess has set himself the task of improve the marque's profitability to 6 percent by 2025, and the best way to do that is sell large, expensive, margin-rich models such as SUVs in high volumes. That's almost the exact opposite of the Beetle. When the subject of a Beetle successor arises in conversation, Diess all but admits that fully electrifying a successor would the model's only hope since VW will be able to build a Beetle underpinned by its new MEB electric platform more cost-efficiently than developing a new combustion engine variant of the car. It could also be more easily engineered for rear-wheel-drive to give it a sportier feel due to the greater flexibility in packaging. The problem is introducing a less-profitable electric version of a niche model comprising just 1 percent of the brand's volumes last year does not make Diess’ job of boosting profitability easier. Perhaps it's not all that surprising that he doesn't appear to be a strong advocate for the model. When it comes to retro VW vehicles, Diess favors the Microbus, which will return as an electric vehicle in 2022, based the I.D.Buzz concept unveiled at the Detroit auto show in January. "The Buzz is a much better emotional concept for the brand than the Beetle," he said at a press event in Lisbon. Even referencing the Beetle as the cornerstone of VW's success in its early years is met with only minor recognition from Diess. "If you go to California, everyone would say it was the Bus." Diess also has a tendency to throw in – without prompting – the name of another heritage model: the Thing, a Jeep-styled vehicle. Citroen has revived its Jeep-style Mehari car as an EV but it's hard to imagine VW doing the same..
"We have so many emotional concepts in our history," Diess said. "We don't have to do a Beetle." Diess's mention of the Thing could be his way of dampening hopes for electric Beetle or an attempt to create a smokescreen to confuse competitors.